Catia V6®, Catia V5®, Catia V4®, Siemens NX®, Parasolid®, Creo®, SolidWorks®, Solid Edge®, Autodesk Inventor®, Acis®, JT®, Cadds®, IGES, STEP, Unisurf, STL (binary and ASCII),OBJ (3D geometry from Wavefront technologies), PLY (Polygon File format), WorkNC® geometry, WorkNC® toolpaths, ISO toolpaths, DXF, DWG®. 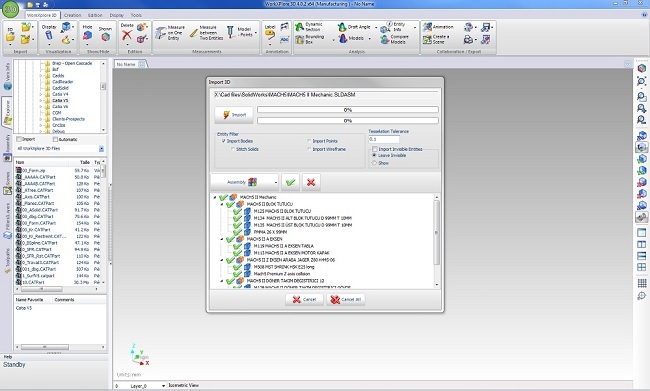 WORKXPLORE has been created for the efficient import and analysis of files of all sizes and types but it is the speed at which it imports large, and even very large, 3D CAD files which is particularly impressive, often taking less than half the time to open a file compared to the original CAD application! The application saves native CAD data in its own lightweight Xplore3D format (.a3D) which also allows specific WORKXPLORE data (measurements, annotations...) to be saved at the same time. This lightweight format can be easily communicated to other members of the project team by e-mail. With WORKXPLORE users can quickly convert standard or native 3D models via the available export interfaces (STEP, IGES, STL, WorkNC CAM geometry).